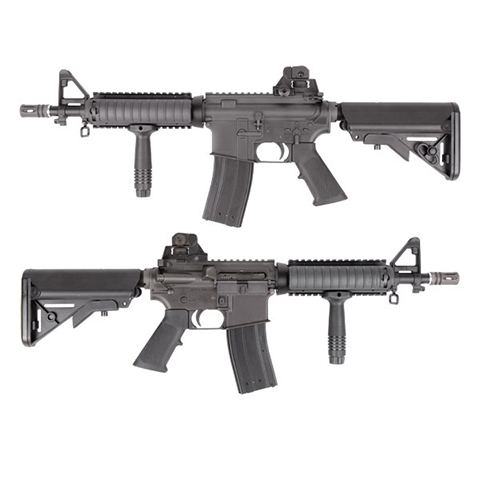 This Colt M4A1 rifle is having the GHK Gas Blowback system as the shooting engine. It is equipped with Nylon Fiber receiver to reduce the rifle weight and high grade Aluminum tactical rail to install accessories. This rifle is an official licensed product with full trademarks and logo (licensed from Cybergun). Green gas is recommended to be used on this GBB. Package comes with a 40 rounds magazine. This rifle GBB system can be interchange with KA M4 AEG gearbox so user can enjoy the GBB and AEG experience from the same rifle. 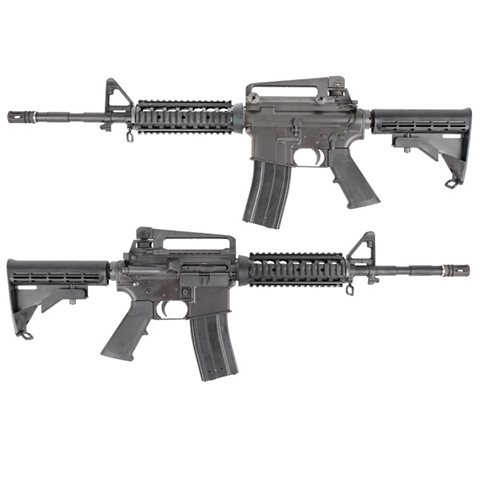 This Colt M4 RIS rifle is having the GHK Gas Blowback system as the shooting engine. It is equipped with Nylon Fiber receiver to reduce the rifle weight and high grade Aluminum tactical rail to install accessories. This rifle is an official licensed product with full trademarks and logo (licensed from Cybergun). Green gas is recommended to be used on this GBB. Package comes with a 40 rounds magazine. This rifle GBB system can be interchange with KA M4 AEG gearbox so user can enjoy the GBB and AEG experience from the same rifle. 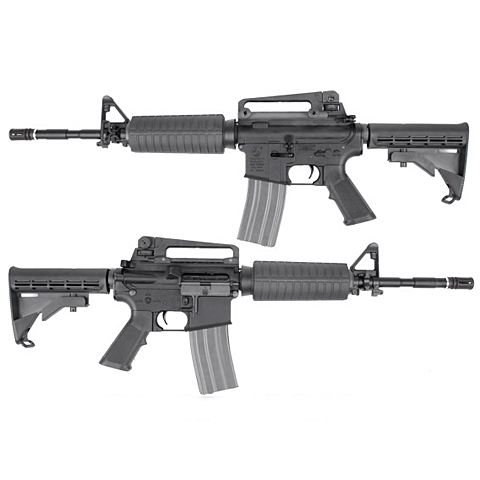 This Colt M4A1 is a gas operating rifle with full Colt trademarks (licensed from Cybergun) engraved on the metal receiver. This GBB package comes with a 50 rounds gas magazine, a foregrip, and a BB loader. Green gas is recommended to be used on this GBB. 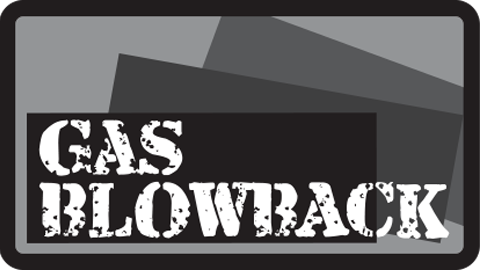 There are two valve blockers included in this King Arms gas blowback rifle package, which one of them is already installed in the rifle. To adjust the power, user can just switch between the higher or lower power the valve blocker. To adjust the Rate of Fire for this rifle, users can use the four different sizes pink color speed buffers to achieve what they prefer. The thickest and thinnest speed buffers have been installed in the stock tube. By adding another speed buffer to reduce the travel distance for the recoil spring, higher ROF can be achieved. 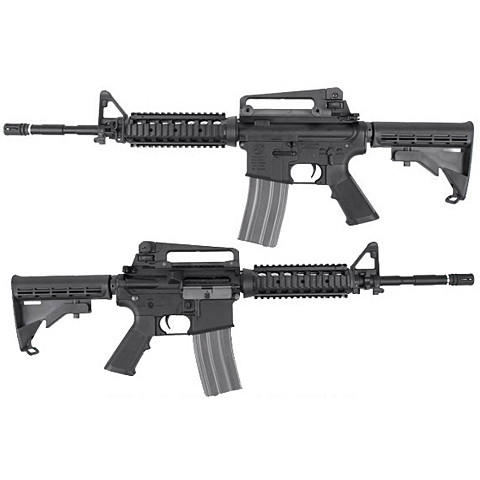 This Colt M4 CQB-R is a gas operating rifle with full Colt trademarks (licenced from Cybergun) engraved on the metal receiver. This GBB package comes with a 50 rounds gas magazine, a foregrip, and a BB loader. Green gas is recommended to be used on this GBB. There are two valve blockers included in this King Arms gas blowback rifle package, which one of them is already installed in the rifle. To adjust the power, user can just switch between the higher or lower power valve blocker. To adjust the Rate of Fire for this rifle, users can use the four different sizes pink color speed buffers to achieve what they prefer. The thickest and thinnest speed buffers have been installed in the stock tube. By adding another speed buffer to reduce the travel distance for the recoil spring, higher ROF can be achieved. 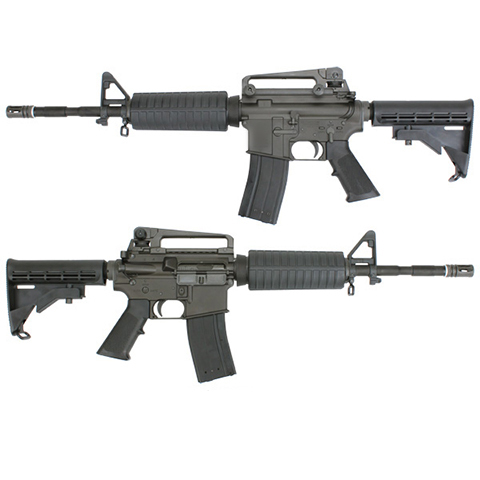 This Colt M4A1 RIS is a gas operating rifle with full Colt trademarks (licenced from Cybergun) engraved on the metal receiver. This GBB package comes with a 50 rounds gas magazine, a foregrip, and a BB loader. Green gas is recommended to be used on this GBB. There are two valve blockers included in this King Arms gas blowback rifle package, which one of them is already installed in the rifle. To adjust the power, user can just switch between the higher or lower power valve blocker. To adjust the Rate of Fire for this rifle, users can use the four different sizes pink color speed buffers to achieve what they prefer. The thickest and thinnest speed buffers have been installed in the stock tube. By adding another speed buffer to reduce the travel distance for the recoil spring, higher ROF can be achieved.